You’ve spent a lot of time and money to create your hunting property, so it only makes sense to post outdoor signs to help protect it. You can easily buy plastic “no trespassing” signs at the local hardware store or discount center, but should you? There’s more to consider than you might think. Aluminum or Plastic Outdoor Signs? Not all plastic signs are created equal. The flimsy plastic signs used to advertise a “truck for sale by owner” simply won’t last in an outdoor environment where a strong wind can tear out the mounting holes. Look online for stronger PVC plastic signs that are made to stand up to outdoor or industrial environments. 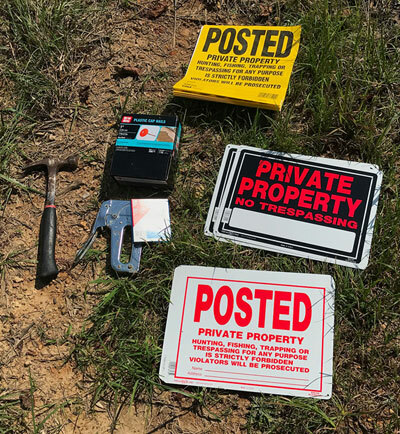 Although these signs are thin and flexible, they will provide longer service than the typical for sale-type sign, helping you protect your land for longer. Aluminum signs provide superior resistance to impacts, wind and vandalism. They weigh and cost more than plastic signs, but their long life makes them a good choice for permanent installations. Aluminum signs are available in varied thicknesses. For easy reference, street parking signs are typically 0.08 (‘2mm) thickness, but thinner 0.04 (1mm) material is another good option. Thicker signs are best for mounting on posts or trees because they are less flexible and can withstand centerline mounting. Thinner signs are good for fence mounting, where all four corners will be supported. Outdoor signs should include a UV resistant coating or laminate layer. High-quality signs are typically manufactured with a clear PVC lamination layer that covers the printing. This layer provides resistance to UV rays that fade signs, as well as resistance to chemicals and scratches. Reflective and glow-in-the-dark materials and anti-graffiti coatings also are available to meet special needs. Will you attach your sign to a fence, post or tree? Signs with mounting holes at the centerline are the clear choice for posts and trees. Corner holes are fine for walls or fences, but wrapping a sign around a tree makes it hard to read. Stainless nails, nuts and bolts are the best choice for outdoor use because they are durable and won’t rust, which can discolor signs over time. If sign theft is a concern, consider tamper-resistant nuts that break away during installation, leaving a smooth cone shape on the end of the bolt. For installation on fences, a variety of straps and mounts are available, including plastic brackets designed for easy one-person installation. Although it’s tempting, zip-ties are not the best choice for mounting aluminum signs, as the sharp edges of the mounting holes can damage the plastic ties. If you need something more than a simple “no trespassing” sign, you’re in luck. Some online sign vendors make it very easy to create custom signs with your own text, symbols or contact information. Novelty signs with messages such as “trespassers will be mistaken for deer” are another option. Sign prices and quality vary widely, so look for a sign company with five-star customer and company ratings and friendly return policies to be sure you get exactly what you need. Peak rut is a magical time in the woods. It’s the one time when normally wary whitetail bucks drop their guard and roam about during daylight hours. For those wishing to maximize their hunting time by keying in on the rut, here are a few tips on recognizing when it’s on. Gildan Activewear Inc. has signed an exclusive partnership with Mossy Oak to produce a variety of items in the activewear, underwear and socks categories. Under the terms of this licensing agreement, Gildan becomes an exclusive manufacturer for specific Mossy Oak products, including underwear and thermal underwear, lounge wear, graphic T-shirts, fleece and blankets. 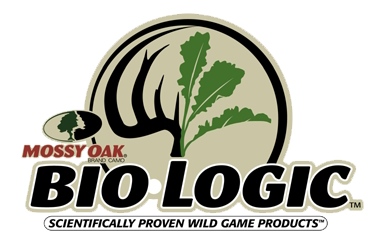 Mossy Oak BioLogic, the leading provider of seed and food plot management products for 17 years, has signed a two-year sponsorship deal with Moultrie's The Hit List on The Outdoor Channel. 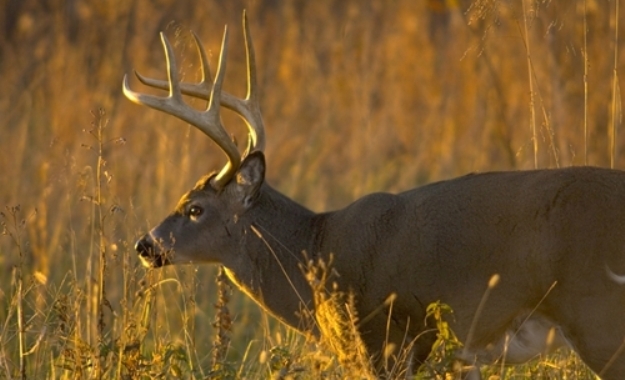 It is no secret that America's love for deer hunting is fueling the demand for quality deer hunting land. Across much of the country, many passionate deer hunters are in the market for a place that they can call their own-and hunt and manage the deer on that property as they see fit.